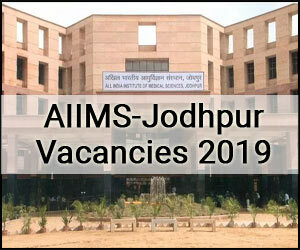 New Delhi: With a recent notice All India Institute of Medical Sciences, Jodhpur (AIIMS Jodhpur) has released 40 vacancies for post of Non-Academic Junior Resident (Clinical) on Contractual Basis. The selection will be done on the basis of Walk-in-interview. Walk-In-Interview for the posts of Non-Academic Junior Resident (Clinical) on contract basis for the period of 12 months at AIIMS, Jodhpur (Rajasthan) on 16/04/2019. AIIMS, Jodhpur has invited application from Indian Citizens for the posts of Non-Academic Junior Resident (Clinical) initially for a period of 12 months in prescribed format and on the terms and conditions as mentioned in annexure “A”. Walk-In-Interview will be conducted on 16/04/2019 (Tuesday) at 10:00am at Medical Superintendent Office, 2nd Floor, OPD Block, AIIMS, Jodhpur (Rajasthan). The Vacancies are in the Department of Non-Academics Junior Resident (Clinical). MBBS from the MCI recognized Institute. The Candidate must have compulsory rotatory internship and must produce internship completion certificate. 1) For eligibility to apply for Non-Academic Junior Resident (Clinical) upper age limit as on 16/04/2019 will be 30 years. This Relaxation for SC/ST candidate up to a maximum period of five (5) years, for OBC candidates up to a maximum period of three (3) years. In case of Persons with Benchmark Disability (PwBD) candidates, age relaxation upto a maximum period of ten (10) years for General Category, thirteen (13) years for OBC category and fifteen (15) years for SC/ST category candidates. Grade-Pay: (Non-Academic): ₹ 15,600-39,100+5,400 (Grade Pay) + NPA Plus other usual allowance or revised pay scale as per 7th CPC as applicable (Level – 10 of the Matrix (Pre-revised PB-3, entry pay of the ₹ 56,100/- PM + usual allowance admissible under rules). NPA is not applicable to non-medical candidates. a). The above vacancies are provisional and subject to variation. The Director, AIIMS, Jodhpur reserves the right to vary the vacancies including reserved vacancies as per the Govt. of India rules/circulars and requirements. b). Reserved for PwBD candidates as per GOI policy. The fee shall be paid in the form of a Demand Draft in favor of “AIIMS, Jodhpur” payable at Jodhpur (Rajasthan). Candidate may deposit the requisite fee in cash at the time of interview. Application fee once remitted shall not be refunded under any circumstances. RESERVATION FOR SC/ST/OBC/PwBD SHALL BE APPLICABLE AS PER GOVT. OF INDIA POLICY. Candidates with disability of lower limbs between 50 to 70% shall be considered and in case candidates are not available of such disability in the category, then the candidates with disability of lower limbs between 40 to 50% can also be considered for admission. The disability certificate should be issued by a duly constituted and authorized Medical Board of the State or Central Govt. Hospitals/Institutions. Note: All candidates, who want to get benefit of reservation/age relaxation/ exemption of fee, should enclose a copy of certificate issued by competent authority in support of their claim. Note: Candidate who have not produced the above mentioned original documents at the time of interview will not be considered. Tenure:- The appointment will be purely on contractual basis initially for a period of 12 months. appointment will not vest any right to claim by the candidate for regular appointment or permanent absorption in the institute OR for continued contractual appointment which may be renewed or terminated as decided by the Institute. Remuneration:- The appointment will entitle the appointee to a remuneration as mentioned. Expiry of contract:- The contract will automatically expire on completion of 12 months until it is renewed with mutual consent for the decided period. The contractual appointment can be terminated at any time by the Institute. The employee can also leave the Institute by giving 30 days’ notice or one month salary in lieu thereof. Leave:- The leave entitlement of the appointee shall be governed by the Institute’s leave rules as amended from time to time. The above posts are being filled-up purely on temporary basis, the candidate will have NO right to claim for permanent Employment under AIIMS or continuation of his/her services. The applicants already in Government service shall have to produce Relieving Certificate from their present employer before joining the Institute. This appointment is whole time and private practice of any kind is prohibited. He/She will have to work in shifts and can be posted at any place in the Institute. He/She should also note that he/she will have to conform to the rules of discipline and conduct as applicable to the Institute employees. If any declaration given or information furnished by the candidate proves to be false or if the candidate is found to have willfully suppressed any material information, he/she will be liable to be removed from services and such action as the appointing authority may deem fit.